As the government continues to scrutinise central marketing spending and the NHS is under threat of major re-organisation, it’s refreshing to know that some NHS authorities are able to splash the cash. In an early front runner for the ‘waste of public money of the year’ award (if there was such an award), a coalition of London NHS trusts has commissioned a new website – http://www.notalwaysaande.co.uk. Does anyone who has figured out they have a hangover or a grazed knee really think they need to go to A&E. Really? And who came up with the seemingly random list of ailments people may want to get online to consider (see screen grab below)? Surely not a medic? 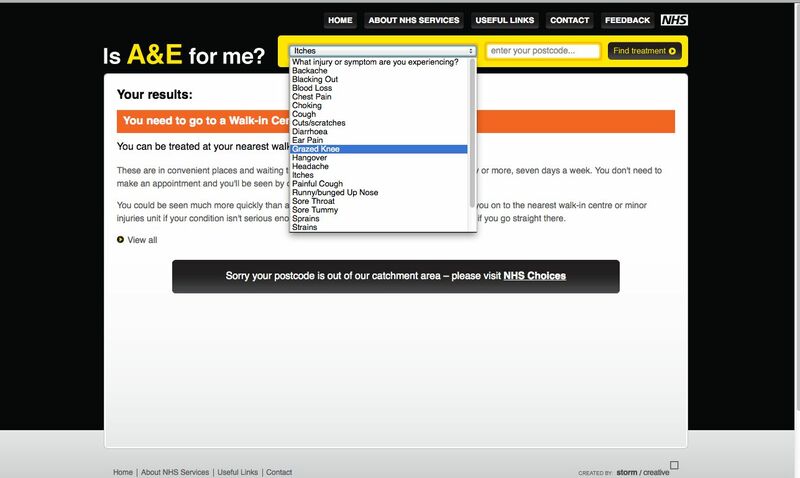 And it only covers certain areas of London for advice – yet doesn’t make this clear on the site. Why would you build a site like this when better, more indepth and nationwide information is readily available elsewhere? 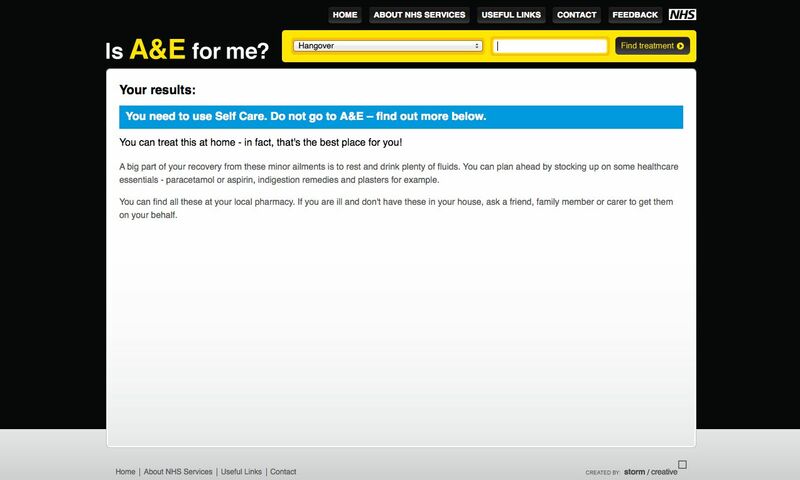 In a time of tightened purse strings, you could understand the local NHS behind this doing a ‘don’t use A&E campaign’ and then directing consumers to NHS Direct, but you don’t need a website as part of this mix. The campaign does make posters in other languages available for community groups (good), but then there’s no multi-lingual options on the site – which again could have been a reason to repeat NHS Direct online information. But then NHS Direct does have an interpreter service – which would be a more appropriate call to action for non-English speakers. And this is the core of the problem. If you’re going to go to the trouble of building a website, you may as well promote it properly. That means search engine optimisation, media relations, social media, online outreach and a full partnership marketing programme… Not just a few posters to try and drive people to a dysfunctional asset. Maybe the campaign will develop and address these points, but as it stands, it’s sad to think that at no point did anyone involved question the wisdom of creating this site and the waste of public funds that it represents. ← 1.2m or 3.7m – what is success for Sun on Sunday? 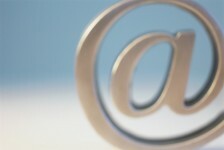 –	The independent evaluation will judge the effect of the campaign and inform future marketing. I would argue that this is a step forward for the NHS in terms of commercial competition rather than a waste of resource. This has gone far beyond just posters, the core asset is actually the printed guide for residents, and the site, a relatively inexpensive and valuable additional outlet. The question must be asked – are you located in the target area, or judging the website as a standalone element from afar? As I say, I am totally in support of open critiquing and welcome debate, and I hope that this comment won’t be seen as a challenge or blindly opposing criticism. Your comments have actually been taken on board and some will be implemented. Critiquing a campaign when you’ve not been involved in the development of it is always a risky business – but I’m pleased that my comments have been taken on board. And I’m glad that the campaign is based on evidence and developed with local residents – of which I’m not one of – so as you rightly point out I probably don’t see the full extent of campaign integration. I still stand by the main premise of the post though – that the site (however inexpensive) does not add enough to the online NHS offer to make it worthwhile in an era where all public sector communicators are battling to justify expenditure on marketing.